← Indoor tournament next weekend! Sign up now! We’re back with another indoor session this Friday! We’ll be at the University of Sussex Sports Centre from 8pm-10pm and it’s just £5 per person! We also have our first tournament of the year this weekend! The SSL Indoor Charity Tournament takes place on Saturday in Portsmouth. 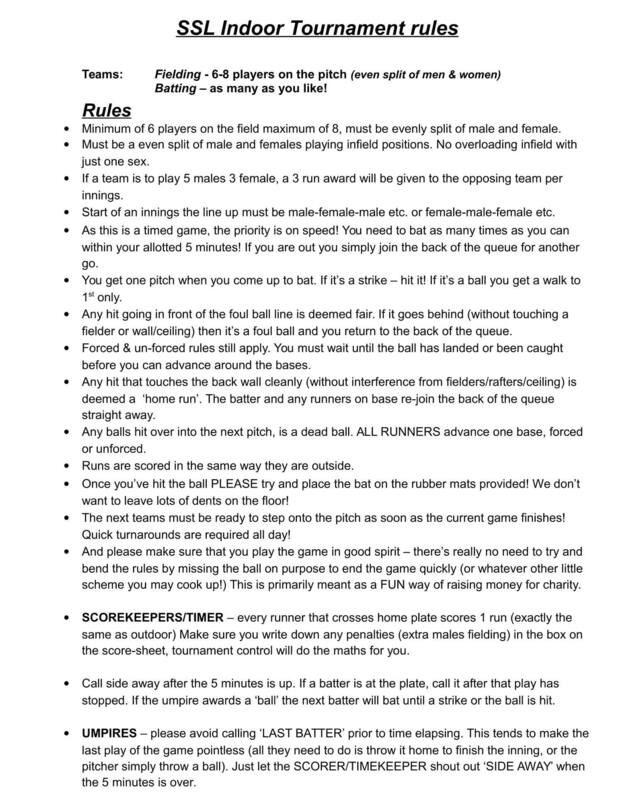 The rules at this tournament are slightly different to what we’re used to, so we’ll be trying them out at our session this Friday to prepare for it. Lastly, our AGM will take place on Wednesday 13th March, 6:30pm at the Crown & Anchor Inn. It’s the perfect opportunity to have your say on how the club is run for the next year. The agenda will be sent out soon but in the meantime if there’s anything in particular you’d like to discuss at the AGM, please let me know. Do you need a new softball glove, bat or any other equipment? Head over to www.baseballandsoftball.co.uk because they’ve very kindly given all Beachcombers members a 10% discount for any orders over £50! We’ve had this discount in the past and it’s been renewed for us for another season! Just use the code BEACHCOMBERS-SOFT-10 when you’re ordering to get the discount. Please note that this discount excludes sale items and kits. It’s a fast-paced, smaller version of softball with adapted rules to suit the indoor setting. Each session is just £5 per person and it’s LOADS of fun! It’s also the perfect way to keep fit during the winter! All abilities are welcome and we supply all the equipment. Be sure to bring your friends! Here are a couple of videos to show you what indoor softball is all about! Visit our online shop and get your own jerseys, hoodies, caps, t-shirts and lots of other fantastic Beachcombers merchandise!